María del Pilar Blanco and Esther Peeren, eds. The Spectralities Reader: Ghosts and Haunting in Contemporary Cultural Theory. Bloomsbury, 2013. 569 pp. With an all-star Table of Contents that includes Giorgio Agamben, Arjun Appadurai, Ulrich Baer, Jacques Derrida, and Gayatri Chakravorty Spivak, among others, The Spectralities Reader compiles the founding texts of what the editors call the “spectral turn,” as well as the more salient critiques that have fuelled one of the more productive debates in the humanities, the social sciences, and the arts over the last twenty-five years. 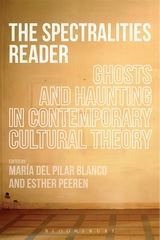 In the introduction, María del Pilar Blanco and Esther Peeren define the spectral turn as the change that occurred at the end of the twentieth century when ghosts ceased to be perceived “as possible actual entities, plot devices and clichés of common parlance” and became “influential conceptual metaphors permeating global (popular) culture and academia alike” (1). The Spectralities Reader deals with this rise of the ghost as analytical tool. However, while advancing the notion of the spectral turn, Blanco and Peeren also distance themselves from previous uses of the term “turn.” They highlight that, by definition, the spectral cannot produce a stable epistemological discourse and therefore urge us to read the spectral turn “not only as a turn to the spectral, but also as the spectralization of the turn—its unmooring from defined points of departure, notions of linear progress, and fixed destinations” (32). Thus the plural “spectralities” in the title. The spectral turn needs to acknowledge that the ghost as such cannot be known, and is never constituted by a single object of knowledge (9). More cartography than chronology, The Spectralities Reader is divided into six sections that aptly navigate the most prolific debates sparked by the spectral turn: 1) theory about the concept of the spectral itself, 2) politics, 3) technologies of vision and media, 4) gender, sexuality and race, 5) space and mapping, and 6) history and historiography. The Reader also includes a general introduction and six section introductions written by the editors. In the general introduction Blanco and Peeren mark the publication of Jacques Derrida’s Specters of Marx (1993) as the point of departure of our spectral journey, and the catalyst of unprecedented academic interest in all things spectral. While the editors acknowledge important antecedents like the work of Terry Castle in the Apparitional Lesbian (1993), and Anthony Vidler’s The Architectural Uncanny (1992), Derrida is credited for rehabilitating the ghost using precisely the two systems of thought that in the first part of the twentieth century produced some of the most scathing criticism against it: psychoanalysis and Marxism. As Blanco and Peeren write, in Specters of Marx “the ghost ceases to be seen as obscurantist and becomes, instead, a figure of clarification with a specifically ethical and political potential” (7). “The Spectral Turn,” the first part of the volume, reflects on the spread of spectrality as a cross-disciplinary instrument of analysis from the 1990s to the present. The articles in this section show “the existence, survival, scope, uses, and effects of what appears as ‘the spectral turn’” (32). Because of its foundational character, the most salient contribution to this segment of the book is the interview with Jacques Derrida conducted by Bernard Stiegler in 1993 and published in Echographies of Television: Filmed Interviews (1996). The interview has the advantage of condensing Derrida’s thought on spectrality and haunting in a more accessible way than his longer works on the subject. Most importantly, the editors highlight the notion that Derrida’s alternative ontology is not only a theory, but an ethics; they frame haunting as a way of thinking sustained by a welcoming relationality that demands responsibility and accountability. A major strength of the book is balance. To achieve this, Blanco and Peeren offer texts that question or complement each other. In this first part of the volume, Jeffrey Andrew’s introduction to The Spectral Turn and Roger Luckhurst’s excerpts from “The Contemporary London Gothic and the Limits of the ‘Spectral Turn’” point to the limits of Derrida’s theory. For example, Andrew’s text challenges Derrida’s unacknowledged reliance on western, Judaeo-Christian thought, while Luckhurst criticizes “the generalized economy of haunting” (35) that he perceives in Derrida’s work and calls for more emphasis for historical and site-specific analysis. “Spectropolitics: Ghosts of the Global Contemporary” addresses “a politics of or for specters” (93). This section stresses that the ghost is culturally specific, and cautions against the rise of a “spectral Esperanto” (92). The essays in this section argue that cultural and historical rooting is key so that the spectral can perform a much-needed “reconceptualization of the frameworks of postmodernism, postcoloniality, materialism, nationalism, and globalization” (20). Taking cultural, historical and geographical specificities into account, the spectral becomes a productive theoretical tool that allows a more comprehensive understanding of the operations and effects of globalization, and underscores how these processes make certain subjects prone to social erasure. The highlights of this section are the excerpts from Achille Mbembe and Arjun Appadurai which invoke spectrality in and from a non-western historical and academic context. Both of these texts remind us that “there are no truly global ghosts” (97), and that in matters of the spectral, careful contextualization and site-specific analysis is a must. “The Ghost in the Machine: Spectral Media” looks at the sociocultural impact of technologies primarily associated with vision and hearing, and explores how their development and consolidation was, and still is, profoundly linked to discourses and practices associated with the supernatural. The articles in this section historicize the scientific revolutions of the mid- and late nineteenth century, explore its relationship to the innovations of our current time, and focus on how even though they seek to dispel the ghost by reaffirming the notion of a disenchanted world through the privileging of a scientific form of knowledge, their modes of working are in themselves spectral and thus bring the ghost back. Tom Gunning’s “To Scan a Ghost: The Ontology of Mediated Vision” is perhaps the most comprehensive essay in this section. By way of a thorough exploration of the history of the “phantom” in visuality studies, Gunning explores the crisis of the senses that the specter continues to produce despite of and through technology. “Modes of Avisuality: Psychoanalysis – X-ray – Cinema,” Akira Mizuta Lippit’s fascinating microhistory of 1895, also stands out. In 1895, the three inventions mentioned in the title revolutionized science, but, more importantly, according to Lippit’s reading, they constitute phenomenologies of the inside that challenged previous notions of what could and could not be seen. By altering the limits of the visual, these scientific innovations initiated a new era of spectral projections that not only “changed the terms by which interiority was viewed, conceived and imagined” (203), but also redefined the meaning of the visual itself. Part Four shows how the categories of gender, sexuality, and race are not only spectral themselves, but also stratify spectrality, underscoring that the categories of gender, sexuality and race are “non-limitative examples of how instantiations of ghosts and haunting are linked to the histories and social positions of specific subjects” (309). This adds layers of complexity to the specter by framing it as a more differentiated concept that would make it more relevant “to the specific past, present, and future struggles for recognition, respect and justice of those identified as non-masculine, non-heterosexual, and/or non-white” (20). “Ghostwriting”, Gayatri Chakravorty Spivak’s 1995 landmark response to Specters of Marx, opens the fourth section of the volume. In what is one of the best-known and more pertinent critiques of Derrida’s seminal book, Spivak points out that Specters of Marx is centered on masculinity and overlooks how capitalism specifically exploits the labor of subaltern women. In contrast, Spivak proposes to mobilize the spectral as an analytical tool with the potential to “redress the silencing exclusion that characterizes particular hegemonic histories and traditions” (311). The last essay of this part, Renée L. Bergland’s “Indian Ghosts and American subjects” provides a fruitful contrast to Spivak’s article. By studying the prevalence of Indian ghosts, both in the western imaginary and in the Native American communities, Bergland claims that the ghost neither allows for a challenging of the status quo, nor makes the voice of the marginalized audible. Instead, it consolidates the exclusionary matrix that precipitated the founding of the nation-state and props up the status quo. The fifth section, “Possessions: Spectral Places,” deals with the spatial dimension of the spectral. The essays selected show that focusing on the temporal disruption of the spectral is important but limited, and that this aspect cannot be separated from the realm of space. This part compiles a powerhouse of contemporary thinkers. Anthony Vidler, Ulrich Baer, David Matless and Giorgio Agamben inscribe haunting into our—individual and collective—experiences of space, and remind us that each place has its own history that both haunts it and haunts us in particular, differentiated, ways. The last part, “Haunted Historiographies,” focuses on the notion of historiography as such. It “explores that ethical and political play that the writer/teller of both place and event must engage with in order to produce a responsible account of what has transpired” (483), and pays special attention to the entanglement of the production of history with notions of possession, the gothic and the uncanny. Alexander Nemerov’s “Seeing Ghosts: The Turn of the Screw and Art History” is the essay that most adeptly illuminates these ideas. By returning to Henry James’s classic story, Nemerov provocatively argues that the governess of the tale could be taken as model for the art historian, because the governess, “like the historian, searches for something that may or may not reveal itself” (485). Through her spectral search, the governess leads the way for what a responsible, self-conscious process of history-making would be like, and highlights the many ways in which “the process of writing history is in fact a haunted (and haunting) practice (483). And they are right. The Spectralities Reader provides a thorough compilation of the main texts that have both consolidated and questioned the spectral turn in the last twenty years. By reprinting foundational texts alongside their most incisive critiques, and welcoming the voices of a diversity of scholars from non-western traditions, as well as those who question the andro-heterocentric scope of academia, The Spectralities Reader is a valuable tool for anyone seeking to better understand the depth and reach of the spectral turn in both academic circles and popular culture. Furthermore, The Spectralities Reader is an indispensable volume for anyone who is interested in specters and is willing to be haunted by them. Juliana Martínez earned her doctorate in Romance Languages and Literatures from the University of California, Berkeley. Professor Martínez specializes in the representation of violence in Latin America in both film and literature, focusing primarily in Colombia. She also works on gender studies and queer theory within the Latin American cultural production. She currently teaches at the Department of World Languages and Cultures at American University, Washington, DC.